San Diego, CA – Kurin Inc., the inventor and manufacturer of 510(k)-cleared Kurin® blood culture collection sets, announced today that the United States Patent Office allowed its patent application and has issued U.S. Patent No. 10,010,282. The Kurin blood culture collection set is a replacement for traditional collection sets, introducing technology to divert skin contaminants while preserving the standard blood culture collection technique for clinicians. Like regular blood culture sets, Kurin sets include a butterfly needle for venipuncture or luer connection to a peripheral catheter and a needle for filling a culture bottle. 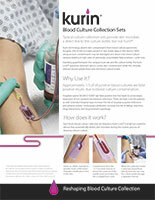 Unique to Kurin is the Kurin Lock™ blood sequestration device, which includes a chamber for diversion of the initial aliquot of blood that often contains skin contaminants from the venipuncture site. 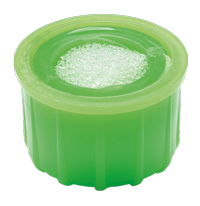 After diversion, the Kurin Lock automatically sends the blood flow around the sequestration chamber through another channel into the culture bottle. Blood culture diversion technology can benefit hospitals and health systems, which suffer significant financial losses due to false positive blood culture results. When sepsis is erroneously indicated, unnecessary treatment and testing may ensue. Furthermore, patients who receive false positive blood culture results may be subjected to unneeded antibiotic treatment and an extended hospital stay, putting them at risk for further adverse events.